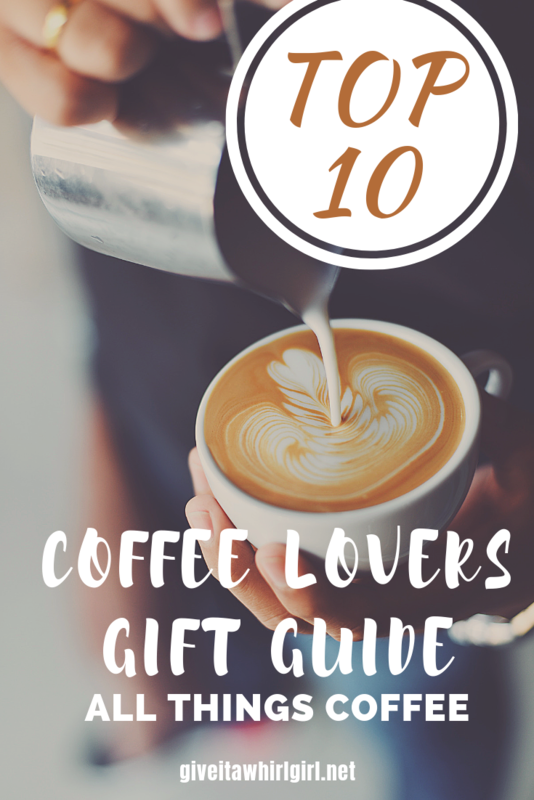 Today I am sharing my coffee lovers gift guide with you. This coffee gift guide features my top 10 coffee favorites all in one handy online shopping guide. Truth be told, and cat is out of the bag… I am a bit of a coffee addict. Just gotta have it! I’m actually on my second cup as I write this post. Every single morning when I first wake up and rise out of bed is to flip the switch on my coffee pot and get that coffee brewing process started. I honestly just can’t imagine going a single day without at least one cup of coffee in my life. True story! Death Wish Coffee has earned the top spot on my Top 10 coffee list and for excellent reason. Though a one-pound bag errs on the side of being a bit pricy, Death Wish Coffee is sure to brew up a fabulous cup of morning coffee! This coffee is fair trade and USDA certified organic. The Death Wish Coffee brand touts itself as being the “world’s strongest coffee” and this brand packs a punch. Bones Coffee is a brand of coffee that you can rely on for fun and unique flavors of coffee! This Bones Coffee variety pack flavors included: Chocolate Raspberry, Medium Roast, White Russian, Jamaican Me Crazy, Strawberry Cheesecake, High Voltage (2x the caffeine), Jacked O Lantern (pumpkin spice), Maple Bacon, French Vanilla, and Salted Caramel. Each 2-ounce bag will brew approximately 6 cups of delicious Bones Coffee. Find out more about Bones Coffee on their website and online store. Many many more fantastic flavors to choose from! Don’t miss out on their popular flavors: Electric Unicorn (a fruity cereal flavored coffee, Peanut Butter & Jelly, S’morey Time (S’mores flavored coffee), and Strawberry Cheesecake coffee. The Bones Coffee online store also has 5-flavor variety packs available in ground or whole bean. Great way to try out several of their creative flavors! These Kiss My Keto instant keto coffee packets are awesome if you are cutting down on carbs and doing a keto diet. Each Kiss My Keto coffee packet contains 2g net carbs. These Kiss My Keto coffee packets contain MCT oil and coconut oil to aid in burning fat. Shop at Kiss My Keto’s online store! Save 10% on your next order with my special Kiss My Keto coupon! Here is a great coffee maker from one of my favorite brands of small kitchen appliances, Ninja! This 12-Cup Ninja Coffee Brewer comes with a promise to brew up the perfect cup of morning Joe with a built-in feature that is called Thermal Flavor Extraction. The carafe is capable of holding 60 ounces of the perfect pot of coffee. Another feature that this Ninja coffee maker has is the ability to brew coffee as a Small Batch, as well as a Classic or Rich mode. I am ready for an upgrade in my kitchen and this Ninja Coffee Brewer looks like the most excellent choice and it is quite budget-friendly. If you are in the market for a Keurig, this Keurig Cafe special edition coffee brewer has excellent reviews and amazing features. This Keurig coffee brewer is capable of brewing either coffee, lattes, or cappuccino. Want a stronger cup of coffee? There is also a special feature on this Keurig coffee maker that allows you to add a shot to your next drink. A Keurig coffee brewer is so fabulous to have on-hand for when you just need one single cup of coffee. The K-cups make it possible to enjoy a single cup of coffee with the touch of a button. This Decaf Is For Wimps coffee mug is from one of my favorite brands – BigMouth! Step aside decaf lovers! This mug just isn’t for you! You can now proudly display your love for the caffeine that one enjoys from drinking coffee. Why not let the whole world know just how much you truly love coffee?!! I vividly remember growing up and watching Bob Ross paint on TV. This here is a heat changing coffee mug featuring the master painter, Bob Ross! It starts off black and once warm coffee is poured into the mug a landscape appears. I recently gave Jordan’s Skinny Syrups a whirl and I was quite impressed! These flavored coffee/drink syrups are FREE of calores, sugar, and carbs! These Skinny Syrups from Jordan’s can fit right into your keto diet and lifestyle. You can enjoy a sweet cup of coffee now without all the guilt. These syrups taste like an indulgent treat but they are guilt-free. Flavors that are included in the variety pack are Salted Caramel Syrup, Vanilla Syrup, Mocha Syrup, Caramel Syrup, Hazelnut Syrup and English Toffee Syrup. Be sure to check out the Jordan’s Skinny Syrups Ice-Cream Collection as well. I am giving this 3-flavor variety pack and honorable mention spot on my Top 10 coffee favorites list. This ice-cream themed variety pack includes Caramel Fudge, Birthday Cake, and Cookie Dough. Oh my goodness! I totally need that in my life. What flavor will you try first? Feel free to leave me a comment. Heads up folks! Incoming awesome coffee creamer that will fit right into your Whole 30, keto, paleo or vegan diet and lifestyle! These individual coffee creamers from NutPods are 10 calories per serving, ZERO carbs, and ZERO sugar. This NutPods creamer variety pack includes French Vanilla, Original, and Hazelnut flavors. Last but certainly not least… I have to share with you one of my favorite clothing and apparel brands… Pyknic! I own a couple of their dolman shirts and I love to share my love of coffee with the world. Pyknic has some really clever coffee designs that earn a spot in your wardrobe! What coffee items caught your eye in my coffee lovers gift guide? Will you be giving anything a whirl from this Top 10 coffee favorites shopping guide? Leave me a comment and let me know what coffee products you are dying to try! LookHUMAN coffee mugs are featured below. Here are my top picks! Did you enjoy this coffee lovers gift guide? Pin this and save it for later! This entry was posted in Shopping Guide and tagged amazon, BigMouth, bones coffee, coffee, coffee creamer, coffeemaker, coupon, coupon code, Death Wish Coffee, drink, gift, gift guide, Jordan's Skinny Syrups, k-cup, keto, keto coffee, keurig, Kiss My Keto, LookHUMAN, ninja, Pyknic, shopping, shopping guide, top 10. Bookmark the permalink. Such great gift ideas for the coffee lover!! I love nut pods, my new favorite creamer! Thank you! I love NutPods too. Great tasting guilt free coffee creamer! There´s only one thing that I like more than coffee, coffee mugs!!! I loved them all but the ones with the unicorns really got my eye! Same here! My cupboard is OVERFLOWING with coffee mugs galore! We all have those friends who love, love their coffee. Would make a great gift basket. I love Death Wish coffee! It’s so strong. Couldn’t live without it, or my Keurig! Great recommendations for coffee fiends. Death Wish coffee is truly the best! I’m TOTALLY grabbing that Bob Ross mug for my husband’s birthday next month! It combines his favorite things – Bob Ross and coffee! These are such great gifts for coffee lovers. Awesome! Thank you! Hope your hubby loves the Bob Ross mug! I love so many of these! Def bookmarking this page for future reference! My go-to at Starbucks is a grande Americano with 3 pumps each of SF cinnamon dolce and skinny mocha sauce, along with steamed heavy cream. At home though it’s either straight black or with heavy cream! This is such a great collection of gifts! I have a lot of coffee lovers in my life and I would love to make a basket for a few of them with some of these gifts. I’m a tea drinker so this is actually really helpful for me. Thanks! As a former barista and current coffee addict I want everything on this list 😂 all the coffee, all the apparel, the new brewers, everything! Aw man…You gotta love anything that’s Bob Ross.